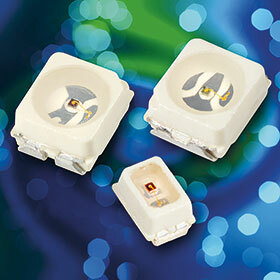 Vishay introduced two new series of surface-mount, automotive grade power LEDs in PLCC-2 and ultra-compact MiniLED packages. Utilising the latest advanced AllnGaP technology in the smallest chip size available, the VLMx335xx and VLMx235xx series deliver high brightness and maximum drive current up to 50 mA for automotive, industrial and consumer applications. The AEC-Q101 qualified LEDs combine low thermal resistance down to 400 K/W with power dissipation of 130 mW, which in turn enables their high drive current. The small 2,3 by 1,3 by 1,4 mm size of the VLMx235xx’s MiniLED package and VLMx335xx’s high luminous intensity to 1400 mcd make them ideal for automotive interior and exterior lighting; traffic signals and signs; and indicators and backlighting for audio and video equipment, LCD switches, and symbols for general use. Offered in super red, red, amber, soft orange and yellow, the LEDs feature a lead-frame embedded in a white thermoplast, with an inside reflector filled with a clear epoxy. The devices offer a ±60° angle of half-intensity, forward voltage down to 1,8 V, a luminous intensity ratio per packing unit of no more than 1,6, and are categorised, per packing unit, for luminous intensity and colour.